94% of respondents to IPA’s 2017 Capacity Building Landscape Scan felt foundations have a role in supporting their grantees’ capacity to carry out their missions more effectively. However, 51% of respondents felt they didn’t feel knowledgeable about effective funding strategies to support nonprofit capacity. IPA is partnering with Indiana nonprofit executives and Indiana foundation professionals to help you strengthen the impact of your philanthropic investments in nonprofit capacity. 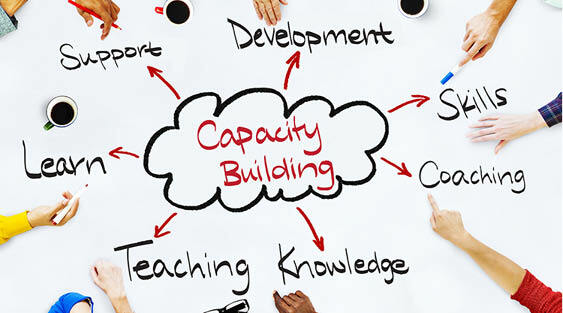 Our Nonprofit Capacity Building Webinar Series includes three programs discussing strategies to help small, mid-sized, and large nonprofit organizations effectively grow, adapt, and deliver stronger programs. Research and best practices will be shared on what Indiana nonprofits need to be more effective and how foundations can support the needs of nonprofits of various sizes and at different points along the nonprofit life cycle. You will learn how you can help your grantees become sustainable by helping them understand how to balance their mission, capital, and programs. You will understand three challenges facing Indiana nonprofits and solutions which you can support to meet those challenges. This series is designed for foundation staff and foundation grant committee members wanting to implement capacity building strategies to enhance their investments in nonprofit organizations. Foundation staff members are welcome to host a “viewing party” for these webinars and invite their grantees to participate in the programs with them. Foundation staff are welcome to host a viewing party for this webinar and invite their grantees. These programs are designed to help foundations support nonprofits with tactics and clear communications regarding terms and outcomes surrounding organizational effectiveness. This is not a program to help nonprofits develop a capacity building plan; rather, this is an opportunity for foundations and grantees to start a dialogue and be on the same page regarding increasing organizational effectiveness. Below are some ideas for getting the most out of this program with your grantees. Grantmakers for Effective Organizations (GEO) defines capacity building as, “the funding and technical assistance to help nonprofits increase specific capacities to deliver stronger programs, take risks, build connections, innovate, and iterate.” This program will utilize the GEO definition of capacity as a framework to discuss the spectrum of activities and strategies associated with helping nonprofits effectively pursue their mission.